How do you use paper flowers in your wedding? Like this! 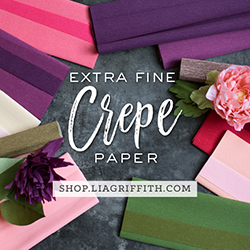 A few months ago, after I finished my Purple & Pink Crepe Paper Flower Bouquet, I was approached by 100 Layer Cake asking me if I wanted my next bouquet to be featured on their site. Of course I said “YES”!!! I’ve been a fan of the blog since before my wedding, so I was more than giddy when I realized what they were asking. I felt sooooo incredibly lucky that they even noticed my work. The paper flower community is so small, but I’m even smaller! After immediately replying “yes” and indicating that I’ll send them something mid- to late- October, I had a fleeting moment of panic that my future bouquet wouldn’t be good enough. Fleeting because I didn’t have time to really dwell on it for too long. I was on my way to finishing oversized flowers for a local wedding and then starting to plan that bouquet (along with bridesmaid bouquets) to meet the shipping deadline. So I pushed the feature opportunity to the back of my mind. And thank goodness I did! With less pressure, I was able to really focus on creating the bouquet for my bride, Heather, rather than for a feature. This last bouquet of this year is arguably my best to date. It is a culmination of everything I’ve learned about paper flowers this year. You can read the 100 Layer Cake feature here. It ended up being a feature on how to use paper flowers in your wedding, with my Orange, Pink & Burgundy Autumn Crepe Paper Bouquet and other paper flowers as inspirational examples. I’ve included some tips on how to use paper flowers in your wedding and also a long overdue paper flower tutorial for chocolate cosmos! So even if you don’t want to read my long essay (which they’ve summarized quite nicely), it might be worth checking out the feature for the tutorial if you’re hungry for some chocolate. Heather’s photographer, Nicole of Nicole Berrett Photography, was kind enough to share some of her photos of Heather with the bouquet for the feature. Doesn’t Heather look amazingly gorgeous? Nicole truly captured Heather’s beauty and spirit. And oh yeah, my bouquet. It’s the best I’ve seen so far. By comparison, Nicole’s photos make my photos look so amateur! If you do want to read my long synopsis about this bouquet, you can read it below. Forgive me for the length by the bouquet had so much in it! This “Autumn Bouquet” as I call it was made for an October wedding in Texas. My lovely client, Heather, wanted to look and feel beautiful, fun, quirky, and relaxed on her wedding day. She had airbrushed the bottom of her lace wedding dress orange ombre, so I wanted to make sure she glowed down the aisle! Heather loved Icelandic poppies, so I knew I wanted to use Icelandic poppies as focus flowers. I was aware that they could bloom in the cooler fall months in Texas, so it wasn’t too much of a stretch to use them. They also come in various shades of orange, which fit Heather’s wedding colour scheme of orange, pink and burgundy perfectly. I also used lighter-coloured poppies and peach coloured garden roses to lightened the colour of the entire bouquet. I let the poppies shoot out of the bouquet as they would in nature, with their thick and unruly stems rising outwards in all direction like wild children; wild but controlled because I didn’t want them to obstruct Heather’s face or her beautiful lace bodice. Creamsicle-coloured parrot tulips add an additional hit of orange and fun. Even though they are not technically fall flowers, I snuck these in because with their long stems, they fit so naturally beside the poppies. Besides, their fluffy petals emulate those of peonies, which was another flower that Heather liked. I placed the parrot tulips so their heads drooped a bit, similar to what real parrot tulips would look like in a vase a few hours after being cut. I mixed in ruffled ranunculuses in various shades of orange and scattered some yellow-orange rose hips around to incorporate different textures and shades. I was mindful of the fact that placing orange and pink flowers next to each other would create a polkadot effect (which I generally loath). My solution was to split the bouquet composition in half, with one side predominantly orange and the other side predominately pink and burgundy, and a set of transitional flowers to blend the two sides seamlessly. For the pink and burgundy side, I brought burgundy into the arrangement by using smokebush foliage. Since the dark foliage is placed under the flowers, it created depth within the arrangement. I wanted to avoid using too many burgundy flowers because I’ve found that the details of a burgundy flower are often difficult to capture on camera when the rest of the bouquet has lighter or brighter coloured flowers. Instead, I focused on using a variety of pink flowers that would pop against the dark burgundy backdrop: garden roses, dahlias, ranunculuses, and spray roses in various sizes. Heather had sent me an inspirational photo of a garland with flowers facing towards the ground, and this inspired me to angle the spray roses to shoot out of the bottom right side of the bouquet. This placement mirrors the Icelandic poppies that are rising out of the opposite side of the bouquet, creating symmetry and balance. Ranunculuses and chocolate cosmos are arranged to lightly danced on top of the other flowers, accentuating the negative space between the blooms. In the middle of the bouquet, I’ve placed four distant drums roses. With their two-toned petals of peach and mauve, they seamlessly draw your eye from one side of the bouquet to the other side. I applied a sepia spray to them to desaturate their colour, and to create a contrast to the highly saturated colours of the other blooms. I’ve thrown in some purple rose buds and anemones, taking inspiration from the mauve colour of the distant drums. To physically and visually bind the flowers together, green foliage was sprayed with burgundy and gold foliage coloured with muted browns and oranges to simulate the changing colour of the leaves. The bouquet is, in essence, a reflection of the changing seasons. I love when I get to the stage where I’m adding foliage because it just elevates the lushness of the bouquet. They’re also a crucial structural element in my designs, since I use them to prop up and support my flower stems from moving around. I tied a cotton ribbon at the base of the bouquet to finish. I actually ended up making these ribbons out of strips of tea-dyed cotton because I couldn’t find any reasonably priced ribbon that I though would suit this bouquet. Heather’s wedding took place at an old cotton mill, so it was a perfect coincidence that I ended up using cotton fabric. This is the most intricate bouquets that I have made to date. With approximately 50 paper flowers and about the equivalent number of foliage, it took about 5 weeks to complete. Granted, I didn’t work on it every day (and when I did work on it, it was only about 4-5 hours per day), but I sure thought about it every day. I also made 5 bridesmaids bouquets for Heather. I took the main flowers from the bridal bouquet and distributed them amongst the five bouquets, which were 1/3 of the size. They turned out colourful and true to the spirit of the bridal bouquet.